They said "How long can you hang around?" Oh will you take me as I am? Will you take me as I am? 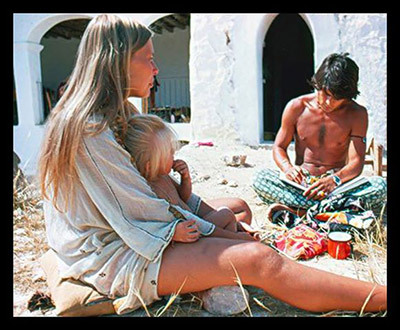 Photographer Karl Ferris writes "This photo was taken in Ibiza, Spain in summer 1970. 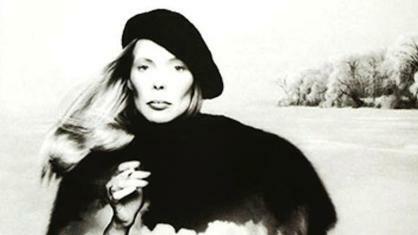 Joni contacted me on the recommendation of my friend Graham Nash. I took her to 'a party down a red dirt road, where there were people, reading Rolling Stone reading Vogue'. The party was at Jann Wenner's house. 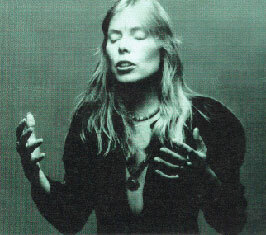 Joni played dulcimer and sang. It was a very blissful afternoon and also Nico dropped by!" Joni is holding top fashion model Willy Van Rooy's son Alejandro. The person painting is Willy's husband Salvador. I think you're right, that when she said "I'll even kiss a Sunset pig", she was talking about a cop on Sunset Blvd which is right down the street from Laural Canyon where she and her hippie friends like Cosby,Stills and Nash,Cass Elliot and all lived. Young people called cops pigs in those days because the cops always broke up their parties and protests on Sunset Blvd. When I first heard this at college in California in the 70's, I was pretty sure that Sunset Pig meant a policeman who worked on Sunset Blvd. Policemen weren't generally popular, since they were seen as repressive "tools of the establishment". She would have been real homesick to be glad enough to kiss a Sunset pig. ginjeanie - It's one of my favorites too but I never really thought about the pig. I always thought it was like someone sayin' "I'd crawl over broken glass on my hands and knees to (insert whatever)". In other words she'd be so happy to get back to California she'd be willing to kiss a pig. And, of course, I always assumed a "Sunset Pig" referred to Sunset Blvd, nothing to do with the orange orb in the sky; just another way to say a California pig. I absolutely adore this song and I'm wondering if anyone can enlighten me to the meaning of what a sunset pig might refer to ?